Flip a coin. If heads, the opponent is paralyzed. If tails, Netta falls down the stairs. This move is an instant kill. Flip a coin. If heads, next opponent sent out will be paralyzed. 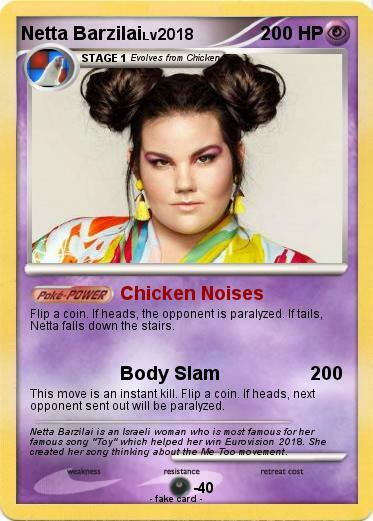 Comments : Netta Barzilai is an Israeli woman who is most famous for her famous song "Toy" which helped her win Eurovision 2018. She created her song thinking about the Me Too movement.